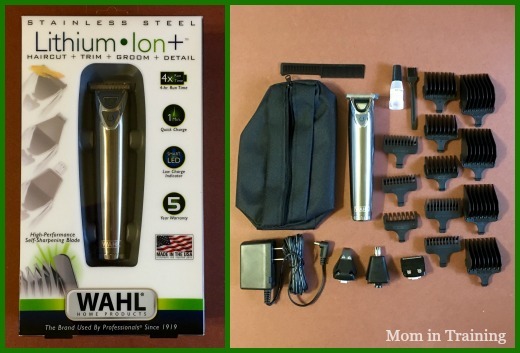 Stacy Tilton Reviews: The Wahl Stainless Steel Lithium Ion plus is ready to go with a 1-Minute quick charge! The Wahl Stainless Steel Lithium Ion plus is ready to go with a 1-Minute quick charge! We've had several different Wahl products in our home over the years but none have had as many attachments or features as the Wahl Stainless Steel Lithium Ion+. My husband was over the moon when this puppy arrived and he unboxed it. He just kept talking and talking about each of the different blade attachments and what he could do with them. I guess you could say this would have made a great Christmas gift for him. Too bad he was home when I opened it, or I might have been tempted to box it back up and save it. My husband likes to shave before work every morning to make a good impression with his new bosses, and his old razor wouldn't work if it was plugged in so if it was dead he was out of luck. This one is equipped with a 1-minute quick charge so even if he forgets to charge the razor when it's dead he can still get enough juice from it to shave before work before he leaves the bathroom. Of course with up to 4x the run time I don't think that will be a problem. So far he's been plugging it in on the weekend and it lasts him all week no problem. This is truly a man's dream for a do-it-all razor.